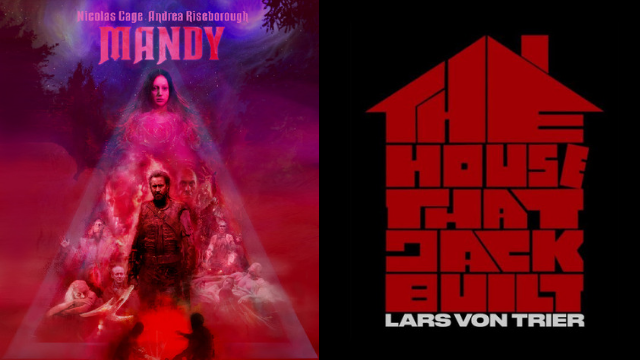 Jason Arment reviews the two movies Mandy and The House That Jack Built and distinguishes them as parody versus satire. Moral ambiguity is all the rage these days, especially when it comes to artists and their work. Panos Cosmatos and Lars von Trier have decided to go against the grain and take audiences to the limits of good and evil. And I mean that literally, not just as something edgy to say in the lede. In fact, if I’m to remain in good faith to critical review, I need to say now that anyone who is a casual moviegoer, or otherwise considers themselves a normal person, should not view either of these movies. However, if you’re a seasoned, calloused film buff, just go see them—right after reading this primer. Both films, and both directors, aren’t trying to win any popularity contests. Instead, they seek to be respected and revered as filmmakers. The films share many parallels—weird endings, plenty of meta self-references, using the lead actor’s past roles to disarm the audience, images of the reaper—but while I viewed them intending to write a review that would compare and contrast the very graspable aspects of the film, the through line I found easiest to recognize are the fighting spirit of both directors. Mandy is a parody, while The House That Jack Built (THTJB) is satire. Both of these devices are often misunderstood and do not lend themselves easily to explanation or definition. The viewer should feel confident in cheering for the good guy in Mandy, while casting a gaze of critical analysis on THTJB, as its satire is unrelenting. Mandy parodies many movies, some from decades ago, but it’s a fever dream and not something to be broken down line by line. THTJB needs you to pay attention to the details and be willing to cross reference them with reality. For instance, there is a scene where red hats come into play. Maybe this could have been just coincidence that they are the same red as Trump’s MAGA hats, if Lars hadn’t admitted that the movie was made partly as a reaction to Trump. Both films are about toxic masculinity. Mandy parodies the classic male revenge trope, and nearly everything that could be a phallic reference actually is one. There are no hot dogs that are just hot dogs, and you are going to see a couple of sausages (dicks, I’m talking about dicks). Because Mandy is a parody, it gets away with flipping some of the script. Mandy isn’t about knowing a bunch of movie trivia, it’s a movie trying to capture what many films contained small pieces of while acknowledging the hackneyed ideas and reinventing a few of them. [Directors] Panos Cosmatos and Lars von Trier have decided to go against the grain and take audiences to the limits of good and evil. The most interesting device is how Nicolas Cage owes each of us at least the price of a movie ticket. Some of the movies he has been in are just that bad. So, his character unfairly starts out with the audience investing reluctantly, able to commit only after Mandy is killed. Oddly enough, that’s when old perceptions of Cage end as well. Maybe even weirder is how THTJB’s Matt Dillon enjoys a little bit of the same dynamic. When I sat down in the theater to watch his performance, I’d heard that it was his best to date. Now, he and Bruce Campbell not only bear each other’s resemblance, but also star in blood-soaked, macabre cult classics. Much like Salò, or the 120 Days of Sodom, THTJB’s extreme content is driven by extreme politics, and it touches on society’s love for quirky serial killers, not just to satirize, but also to curry favor with the audience while carrying out the most egregious brutalities. Much like Salò, if a viewer can make it through the first third of the film, they can probably handle the rest. The second third of the film felt like a few thought exercises woven together with the narrators never-ending stream of lies, and the counters given by the confessional voice-over’s copilot. The House that Jack Built is about man’s conceits: politics, music, art, engineering, architecture, war, fake news, reaping the harvest, hunting, and the self-proclaimed victimhood of earth’s most notorious killer—the white man. What critics have missed is how Jack’s ideals corrupt through fetishism, implode, and then turn in on themselves, giving birth to the black hole that is Jack. Most, if not all, of the criticisms and reviews I’ve seen have been by white males, which is exactly why I think these two films are the lowering of a sarcophagus onto film turned ideological killdozer. The film industry, Hollywood, and American society at large has a problem preying on the weak. Lars and Thanos have decided who they don’t need; Lars highlights as the end credits role with “Hit the Road Jack” playing. Whether or not they continue their rampage in the future is impossible to know. But much like the repeated image of men hard at work, scythes whispering across grass as they all breathe and swing in unison, these two are not afraid of a reckoning, even while the workers are few. Jason Arment is the author of Musalaheen, a war memoir published by University of Hell Press. Jason Arment served in Operation Iraqi Freedom as a Machine Gunner in the USMC. He's earned an MFA in Creative Nonfiction from the Vermont College of Fine Arts. His work has appeared in Narrative Magazine, Lunch Ticket, Chautauqua, Hippocampus, The Burrow Press Review, Dirty Chai, and War, Literature & the Arts: An International Journal of the Humanities; anthologized in Proud to Be: Writing by American Warriors Volume 2 & 4; and is forthcoming in Gulf Coast, The Florida Review, and Phoebe. Jason lives in Denver.